Arunachal Pradesh Chief Minister Pema Khandu on Wednesday claimed Arunachal is the number one performing state in Northeast in the implementation of many important central governments’ flagship schemes. Speaking at the BJP legislature party meet here, Khandu said the state government achieved the distinction in implementation of the following schemes – Saubhagya, Pradhan Mantri Awas Yojana (Rural and Urban), wellness centre, soil health card and Ayushman Bharat. 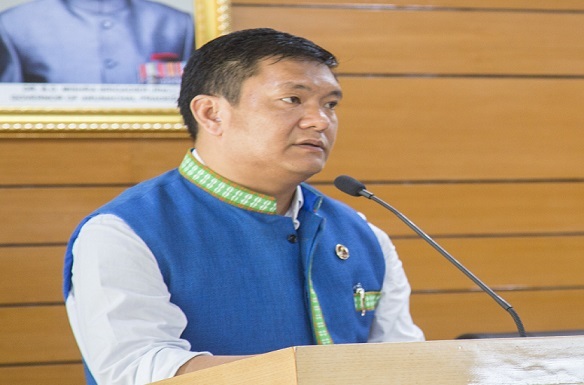 “The state’s performances are not only judged based on state government’s report but also through centre’s own independent reports,” Khandu said highlighting the outcome of the recently held Chief Minister’s conference of all BJP ruled state in New Delhi which was chaired by Prime Minister Narendra Modi. He said in many other important sectors as well, Arunachal’s performance is far ahead than many states in mainland India. “Arunachal today has good reputation and respect in the eyes of centre,” Khandu said and stressed the importance of such interactive meetings which help in providing motivation and guiding principles to perform better. He said BJP being a party with difference; Arunachal should follow party based politics instead of leader-based politics. “I would be happier if legislators and party workers rely more and draw motivation from party ideology and principles rather on my leadership,” he added. To better connect with the people, the CM urged the legislators to take active part during Jan Sunwai Sammelan, a platform where all the government departments and administration hold regular meetings with people for redress of grievances and to provide services. He said the outcome of Jan Sunwai Sammelan organized in different districts over the last one month has been positive with 15000 beneficiaries added. The chief minister also said the issue of Greenfield airport for state capital and Smart village movement has been receiving positive support from Prime Minister himself.